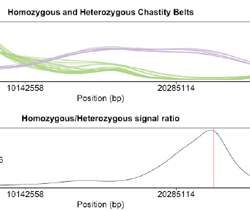 Web-based tools for visualizing functional genomics and other data. but we also create tools for the wider research community. We're passionate about data visualization. Feel free to explore and use our tools. If you find them helpful, cite us! The BAR celebrated its 10th birthday in 2015! The original BAR paper by Toufighi et al. was published in 2005 in The Plant Journal. 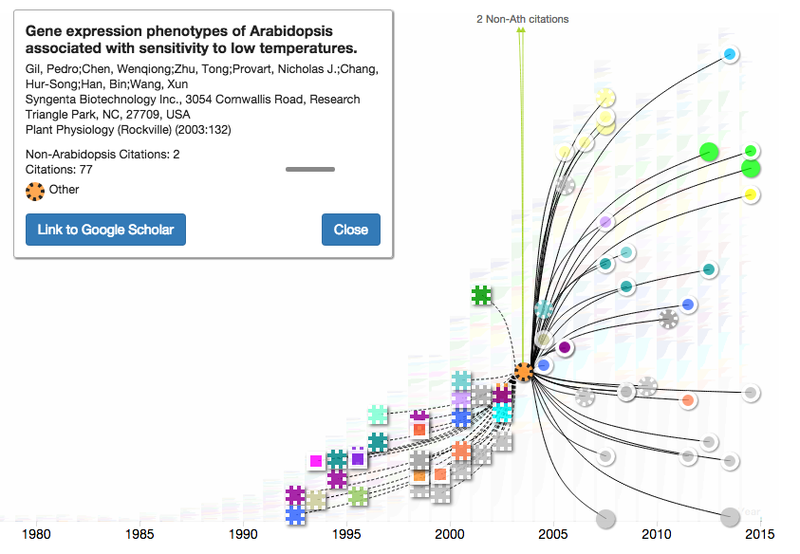 Explore the past 50 years of Arabidopsis research with our new citation network explorer. 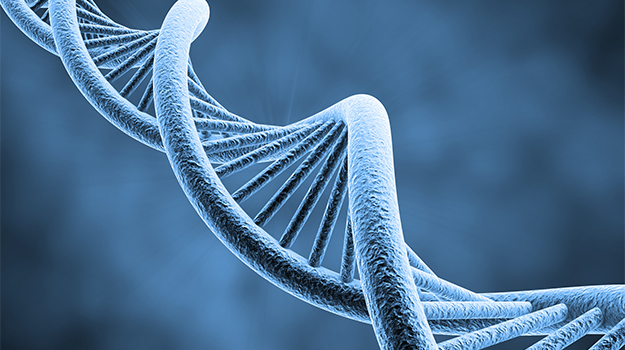 The Centre for the Analysis of Genome Evolution and Function helps sponsor the BAR's operations. 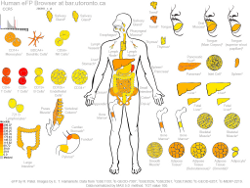 View expression patterns as electronic fluorescent pictographs or heatmaps, explore promoters, identify protein-protein interactions and more. Perform Next Generation Mapping, or generate your own markers using our molecular marker tools. Remove duplicates, perform multi-dimensional Venn analyses, or generate random lists of identifiers. Try our new Wheat eFP Browser, published together an extensive analysis of gene expression of homeologous genes in wheat with Cristobal Uauy and colleagues in Science Magazine! We have given a complete UX makeover to the our original Expression Angler. 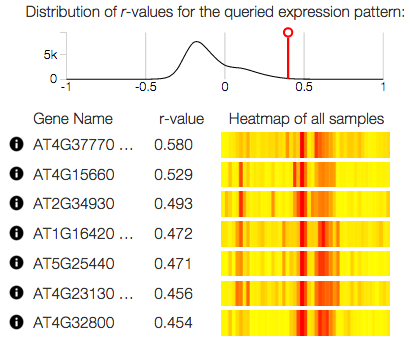 Now you can find genes with similar expression patterns by describing the profile you are looking for with a graphic user interface. Try Expression Angler 2016 and let us know what you think! 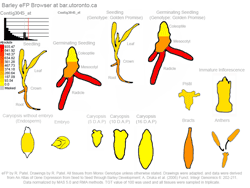 ePlant helps biologists visualize the natural connections between DNA sequences, natural variation (polymorphisms), molecular structures, protein-protein interactions, and gene expression patterns by combining several data visualization tools with a zoomable user interface Waese et al. 2017. 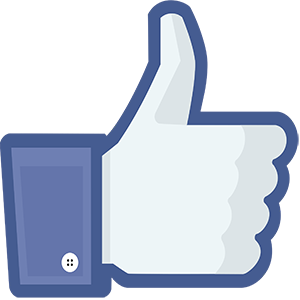 Thanks for liking us more than 1000 times on Facebook. If you haven't clicked that button yet, like us to keep up-to-date with the latest BAR and plant bioinformatics news. It might help us get funding down the road too! 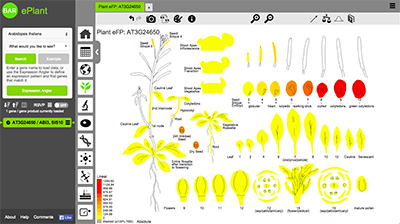 ePlant helps biologists visualize the natural connections between DNA sequences, natural variation (polymorphisms), molecular structures, protein-protein interactions, and gene expression patterns by combining several data visualization tools with a zoomable user interface. 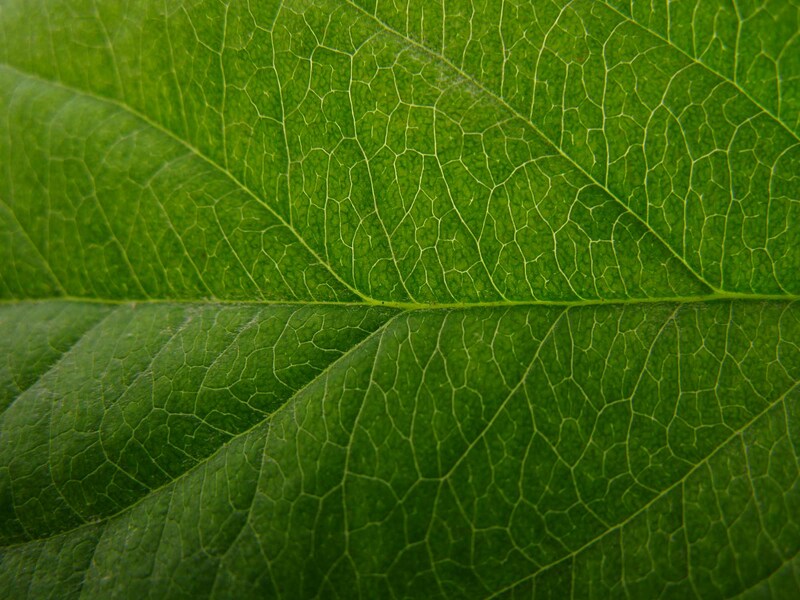 ePlant connects to several publicly available web services to download the latest genome, interactome, and transcriptome data for any number of genes or gene products you may be interested in. Data is displayed with a set of visualization tools that are presented with a conceptual hierarchy from big to small. Links between the different views help underscore connections between multiple levels of analysis. Seamlessly explore data from the kilometre to nanometre scales for Arabidopsis, including natural variation data, organ and cell-type-specific gene expression patterns, subcellular localization, protein-protein interactions, and protein tertiary structures predicted for ~70% of the proteome. Create 'electronic fluorescent pictographic' representations of your gene of interest's expression patterns based on the Schmid et al. 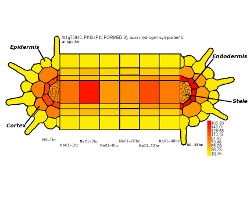 2005 Map of Arabidopsis Development, the AtGenExpress Consortium data (Abiotic Stress - Kilian et al. 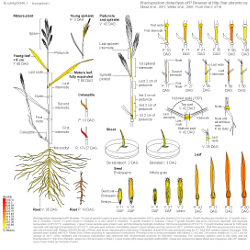 2007, Biotic Stress, and the Chemical and Hormone Series), cell-type or seed-specific data and other data. 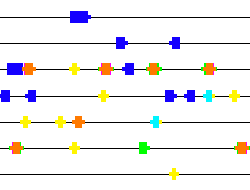 Shown is an example output image from the eFP browser showing the expression pattern of ABI3 in the Developmental series generated by Schmid and colleagues from Detlef Weigel's group in Tübingen. Create 'electronic fluorescent pictographic' representations of your gene of interest's subcellular protein product localisation based on documented and predicted subcellular localisations in Heazlewood et al. 's SUBA database. Shown is an example output image from the Cell eFP Browser showing the subcellular localisation pattern of the gene product of At3g26520, encoding Tonoplast Intrinsic Protein 2, false coloured according to degree of support for a given location. Create 'electronic fluorescent pictographic' representations of your gene of interest's mRNA levels in the seed coats from two wild-type and two mutant strains of Arabidopsis at 3 different developmental stages. Data are from Dean et al. 2011 (Analysis of gene expression patterns during seed coat development in Arabidopsis, in Molecular Plant). 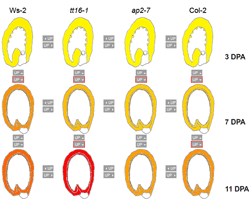 Shown is differential expression of ABI3 in different Arabidopsis seed coats. Create 'electronic fluorescent pictographic' representations of your gene of interest's mRNA levels on polyribosomes in specific cell populations of seedlings under non-stressed and hypoxia-stressed conditions. Data are from Mustroph et al. 2009 (Profiling translatomes of discrete cell populations resolves altered cellular priorities during hypoxia in Arabidopsis). Shown is differential expression of SUS1 in different Arabidopsis tissues under hypoxia stress. Create 'electronic fluorescent pictographic' representations of your gene of interest's salt regulated spatial-temporal expression in the Arabidopsis root. Data from Geng Y. et al. 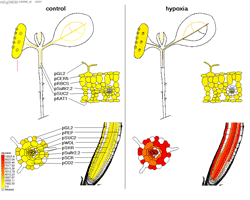 2013 (A Spatio-Temporal Understanding of Growth Regulation during the Salt Stress Response in Arabidopsis). Shown below is differential expression of PIN3 in Arabidopsis root. Expression Angler 2016 is a graphic user interface for our original Expression Angler. We have given the tool a complete UX makeover with the goal of making it easier to use. This tool finds genes with similar expression patterns by calculating the correlation coefficients for all gene expression vectors as compared to an expression pattern that you define, or to an expression pattern associated with an AGI ID or gene name that you specify. The output of this tool displays an eFP image depicting the expression data and correlation coefficients for each gene that meets your cut-off criterion, or specified number of hits. This verson of the tool still works but we recommend using Expression Angler 2016instead. 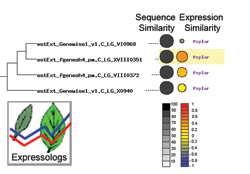 Poplar Expression Angler finds co-expressed, anti-correlated, or condition/tissue-specific genes in two poplar data sets from the Campbell Laboratory. Sampler Angler identifies samples exhibiting similar expression profiles, that is it will answer the question, 'which samples have the most similar expression profiles as the profile from my sample of interest?' Useful for chemical genomics or typing mutant tissues. 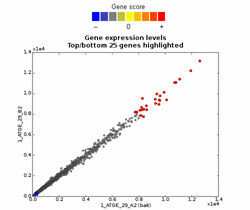 Genes contributing the least or the most are highlighted in blue or red in the output scatterplot, shown as an example in this panel. In beta-testing, so feedback is welcome. Perform electronic Northerns using the Expression Browser, i.e. ask how up to 125 genes of interest are being expressed, with the gene expression data sets accumulated to date in the Botany Array Resource (BAR) DB or public data sets from the AtGenExpress Consortium (Developmental - see the Schmid et al. publication, Abiotic Stress - Kilian et al. 2007, Pathogen, and Hormone Series), or others. Automatic clustering can be performed. Our databases contains more than 75 million expression measurements. 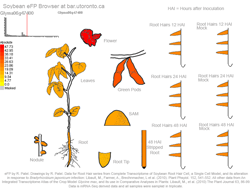 Perform electronic Northerns using the Poplar Expression Browser, i.e. ask how up to 125 genes of interest are being expressed, with the gene expression data sets accumulated to date in the Campbell Lab's PopGenExpress developmental or drought stress data sets. Create 'electronic fluorescent pictographic' representations of your gene of interest's expression patterns based on data generated by Malcolm Campbell's Laboratory. Create 'electronic fluorescent pictographic' representations of your gene of interest's expression patterns based on the Benedito et al. 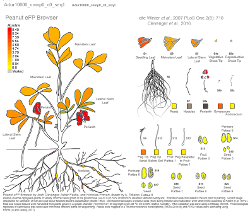 (2008) Gene Expression Atlas of the Model Legume Medicago truncatula. Create 'electronic fluorescent pictographic' representations of your gene of interest's expression patterns based on two soybean data sets based on data from Libault et al. 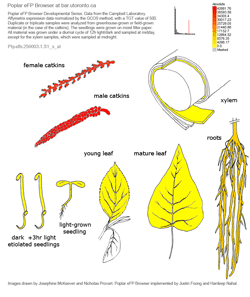 's 2010 Plant Physiology and Plant Journal papers. Create 'electronic fluorescent pictographic' representations of your gene of interest's expression patterns based on Massa et al. 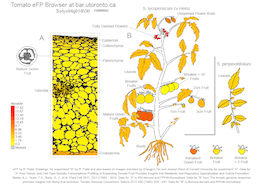 (2011) The Transcriptome of the Reference Potato Genome Solanum tuberosum Group Phureja Clone DM1-3 415R44. Create 'electronic fluorescent pictographic' representations of your gene of interest's expression patterns based on data from Matas et al. 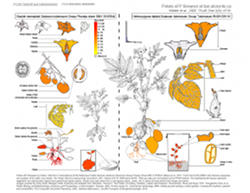 (2011) Tissue- and Cell-Type Specific Transcriptome Profiling of Expanding Tomato Fruit Provides Insights into Metabolic and Regulatory Specialization and Cuticle Formation. Create 'electronic fluorescent pictographic' representations of your gene of interest's expression patterns based on data from Champigny et al. (2013) RNA-Seq effectively monitors gene expression in Eutrema salsugineum plants growing in an extreme natural habitat and in controlled growth cabinet conditions. 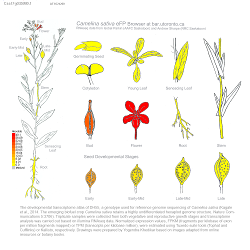 Create 'electronic fluorescent pictographic' representations of your gene of interest's expression patterns based on data from Camelina sativa plants. The gene expression atlas and eFP images were generated by Isobel Parkin and colleagues at Agriculture and AgriFood Canada in Saskatoon. Create 'electronic fluorescent pictographic' representations of your gene of interest's expression patterns based on data from Arachis hypogaea plants. 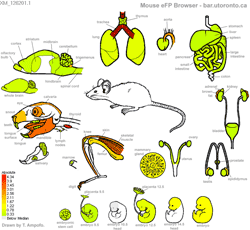 The gene expression atlas and eFP images were generated by Peggy Ozias-Akins and colleagues. Create 'electronic fluorescent pictographic' representations of your gene of interest's expression patterns based on data from Fasoli et al. 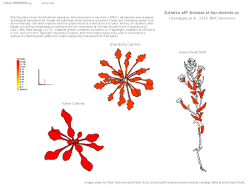 (2012) The Grapevine Expression Atlas Reveals a Deep Transcriptome Shift Driving the Entire Plant into a Maturation Program. 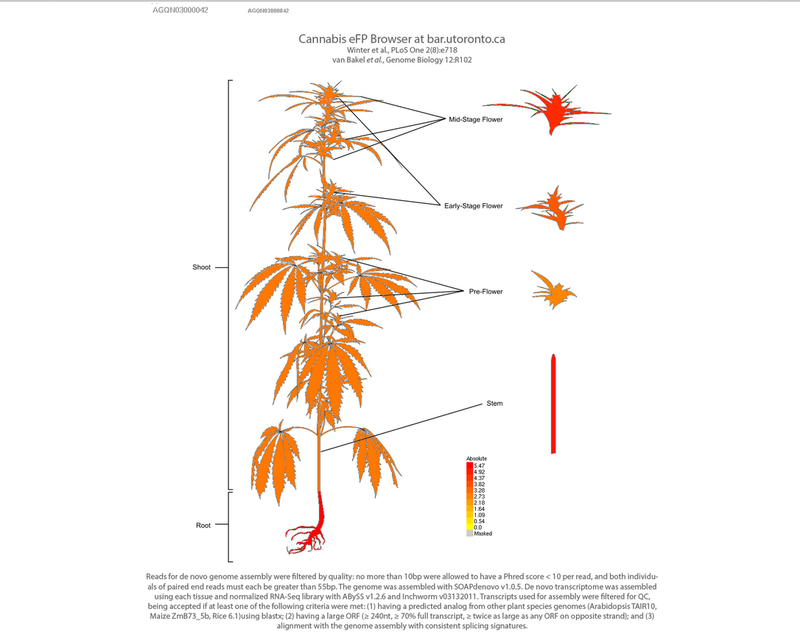 Create 'electronic fluorescent pictographic' representations of your gene of interest's expression patterns based on data from van Bakel H et al., "The draft genome and transcriptome of Cannabis sativa. ", Genome Biol, 2011 Oct 20;12(10):R102. The reads were remapped to the most recent version from Laverty KU et al., "A physical and genetic map of Cannabis sativa identifies extensive rearrangements at the THC/CBD acid synthase loci. ", Genome Res, 2018 Nov 8;29(1):146-156. 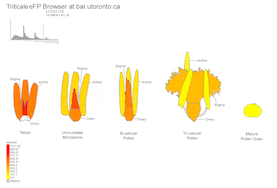 Create 'electronic fluorescent pictographic' representations of your gene of interest's expression patterns in different parts of the maize leaf as published by Thomas Brutnell's group and others. Create 'electronic fluorescent pictographic' representations of your gene of interest's expression patterns based on two rice gene expression publications. Create 'electronic fluorescent pictographic' representations of your gene of interest's expression patterns based on two barley data sets. Create 'electronic fluorescent pictographic' representations of your gene of interest's expression patterns based on two triticale data sets normalized using RMA and MAS5. 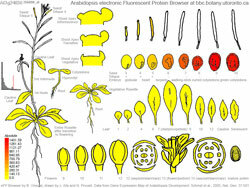 Create 'electronic fluorescent pictographic' representations of your gene of interest's expression patterns based on Brachypodium Atlas dataset. Create 'electronic fluorescent pictographic' representations of your gene of interest's expression patterns based on Wheat Atlas dataset. Create 'electronic fluorescent pictographic' representations of your gene of interest's expression patterns based on Physcomitrella data set. Create 'electronic fluorescent pictographic' representations of your gene of interest's expression patterns based on the Zhang et al. (2004) Functional Landscape of Mouse Gene Expression. The thumbnail image is an example output from the Mouse eFP browser showing the expression pattern of myosin. Create 'electronic fluorescent pictographic' representations of your gene of interest's expression patterns. 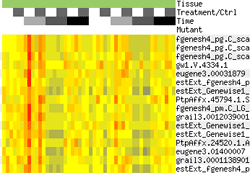 The thumbnail image is an example output from the Human eFP Browser showing the expression pattern of CCR5. Use this program to identify expressologs for your gene of interest in other species, that is, homologous genes that exhibit similar patterns of expressions in equivalent tissues in these other species, insofar as they exist and we've been able to identify tissue equivalencies for these species. Use the link here to directly access the Expressolog Tree Viewer, or click on the "two leaf" icon (as depicted in the thumbnail here) that appears at the top of our eFP Browser outputs to be taken to the Expressolog Tree Viewer to view expressologs for your gene of interest. Use this program to identify over-represented n-mer 'words' in the promoter of a gene of interest, or in promoters of co-expressed genes. Words that map to PLACE are highlighted in the output listing. 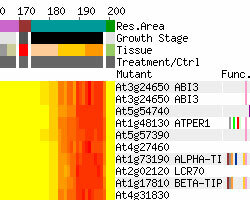 A Promomer output image below shows the over-representation of the 4mer ACGT, which forms the core of the ABRE, in promoters of genes up-regulated in mesophyll cells upon ABA application, reported by Leonhardt et al. (2004). Use Cistome to predict novel cis-elements in the promoters of co-expressed genes using several 3rd party cis-element prediction programs, or a new version of Promomer called Promomer2. Or, map on known cis-elements from PLACE. Cistome can also be used to map on PSSMs or consensus sequences onto the promoters of a defined list of AGI IDs. The output includes a sequence logo representation of the elements identified by the mapping. See if there are predicted (interolog) or documented interaction partners with your gene of interest. 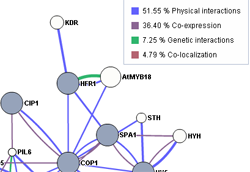 The Arabidopsis Interactions Viewer queries our database of more than 70,000 predicted interactions from Matt Geisler at SIU or 36,000 literature-documented interactions. We also append these interactions in the output of Expression Browser and Expression Angler. Conversely, it is now possible to paint expression levels onto AIV nodes for any one of about 3500 expression data sets in the BAR. See an example of these interaction loops here. A major overhaul of the predicted and documented Arabiodpsis protein-protein and protein-DNA interactions visualization tool, Arabidopsis Interactions Viewer (AIV). 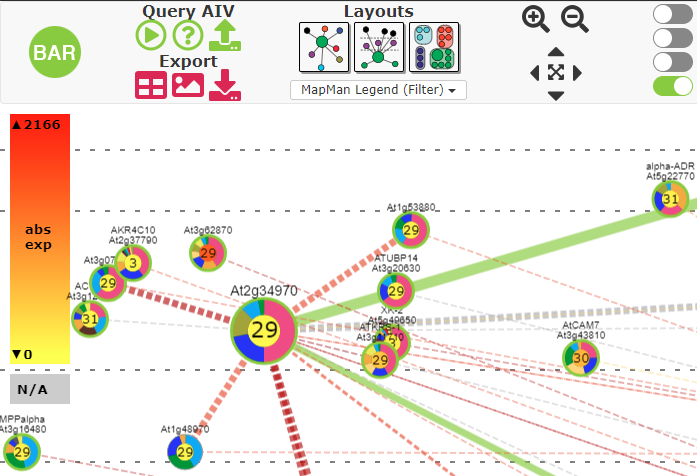 AIV2 has new updates such as faster technologies, extensive filtering options, more up-to-date interactome data, localization layouts and a cleaner user interface. Users can also choose to export their network via CSV or JSON. See if there are predicted (interolog) or documented interaction partners with your rice gene of interest. The Rice Interactions Viewer queries our database of more than 37,000 predicted interactions from Matt Geisler at SIU or 68 literature-documented interactions from the literature. It is also possible to paint expression levels onto RIV nodes for any one of several hundred expression data sets in the BAR. Make long sequence logos and zoom in and out of them with Gene Slider. Use the search panel to automatically highlight motifs of interest, even when there is a high degree of wobble. Slider controls for each position of a search query make it possible to assign certainty thresholds to control whether the search function will recognize partially conserved matches. A navigation slider at the bottom of the screen indicates which region of the sequence is currently being displayed. Coloured markers along this slider indicate where query motifs have been identified, making it easy to see where multiple matches have been found. Search among 113 RNA-seq data sets used by Araport 11 to reannotate the Arabidopsis genome (Cheng et al. 2016, http://biorxiv.org/content/early/2016/04/05/047308). The eFP-Seq Browser will retrieve the number of reads mapped and display these above the desired Araport 11 gene model. You can sort or filter the columns. NGM allows for the rapid localization of recessive EMS induced mutations within an F2 mapping population that has been pooled and sequenced en masse using a next-generation sequencing platform. We have generated all possible potential computationally-derived Col x Ler markers and for 96 other Arabidopsis accessions using sequences generated by the Nordborg laboratory (2005) and Lander et al. (2002). 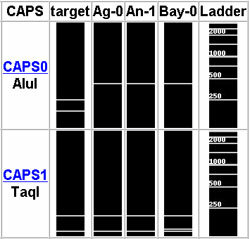 User-friendly features include virtual gel representations of how the CAPS markers would run for each accession. Blast Digester will analyse a nucleotide BLAST output for restriction enzymes which differentially cut the aligned sequences. It is useful for generating CAPS or PCR-RFLP markers for mapping. Clicking on a highlighted restriction site in the output, e.g. the NdeI site in the example below, automatically activates the Primer3 program at the Whitehead Institute for easy PCR primer generation. CapsID helps in the generation of the most parsimonious set of genotyping markers for distinguishing different species/varieties/accessions. User-friendly features include virtual gel representations how the CAPS or PCR-RFLP markers would look in each species/variety/accession. Thomson Reuters' Biosis database covering publications from 1800 to March 2015 was searched for papers with Arabidopsis in the title, abstract or keywords. This resulted in a data set of 54,116 papers. This tool displays 54,033 publications from 1965 to March 2015 colored according to their concept codes, and it draws lines to represent citations between the papers. ClustalW with MView output is a web-based version of the old multiple sequence alignment classic by Dr Julie Thompson, now at the University of Strasbourg. 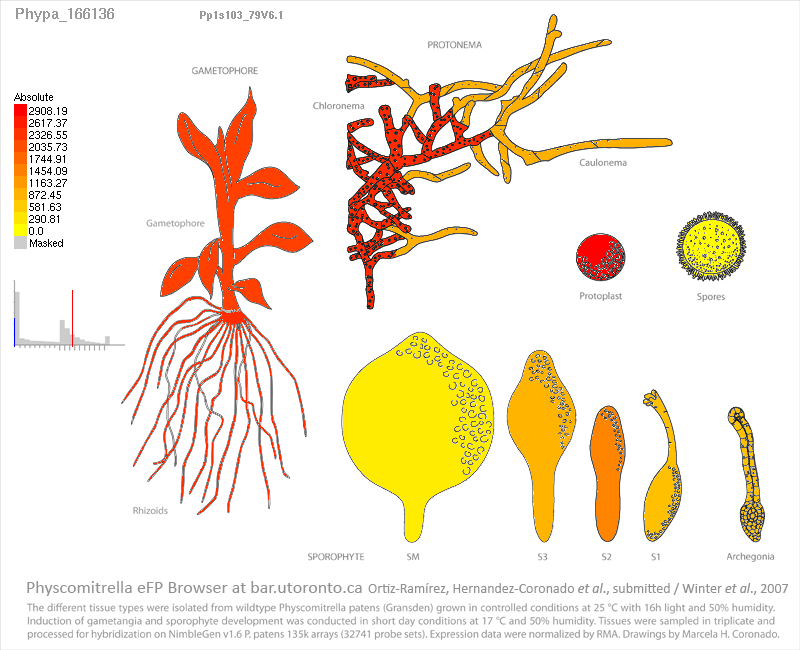 DataMetaFormatter is a powerful tool for reformatting Arabidopsis expression data and adding multiple pieces of meta-information, such as protein-protein interactions, functional classification etc. 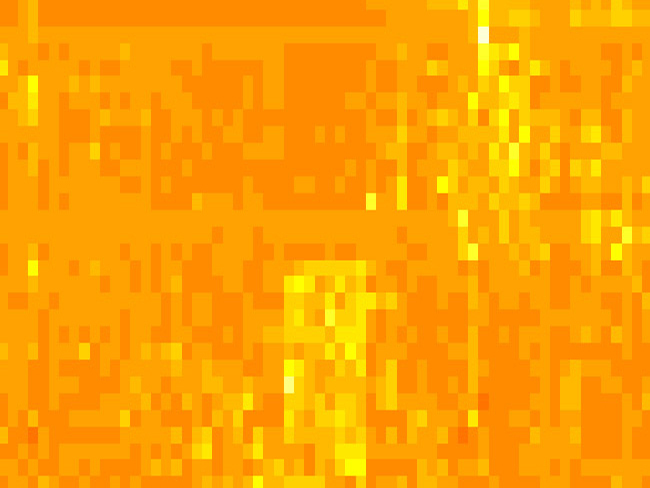 A clickable heatmap is generated, as well as a table of values. HeatMapper is a general tool for applying a third dimension of information via colour-coding to a 2-D table of data. HeatMapper Plus is a general tool for applying a third dimension of information via colour-coding to a 2-D table of data plus a thumbnail graphic in addition to the table. Duplicate Remover removes duplicates in lists. It saves you having to import the data into Access. It will also tells you which things were duplicated and how often. Venn Selector shows identifiers in common and unique to two sets of sequences. 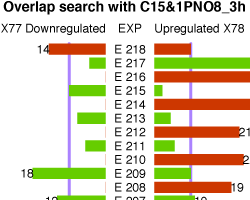 Fetches annotation, too, in the case of Arabidopsis AGI IDs. It saves lots of copying and pasting into GeneSpring or whatever other tool provides this functionality. Venn SuperSelector allows you to input multiple lists of genes or term with associated values. Its Output is a tabular representation of which genes are in common to which list and their values. Plus Annotation, plus Functional Classification, in the case of Arabidopsis AGI IDs. The output may be easily copied into Excel and then sorted as you like. The Random ID List Generator allows you to generate n sets of y genes containing z number of randomly generated Arabidopsis AGI IDs. Use the Arabidopsis Genetic Uniqueness and Rendundancy Revealer program to identify samples from the AtGenExpress gene expression data sets, or your own data set, in which one gene is uniquely expressed or in which several genes are potentially redundantly expressed. The program highlights the samples where a phenotype in the single or appropriate double or higher-order mutant is most likely visible. In beta-testing, feedback welcome! Classification SuperViewer generates an overview of functional classification of a list of AGI IDs based on the GO database. Also, a ranking score is calculated for each functional class, which may be better than absolute numbers. The input set is bootstrapped 100 times to provide some idea as to over- or under-representation reliability. 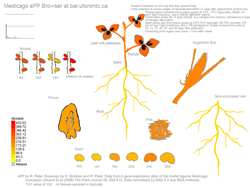 Medicago Classification SuperViewer generates an overview of functional classification of a list of gene IDs based on the UniProt and agriGO databases. Also, a ranking score is calculated for each functional class, which may be better than absolute numbers. The input set is bootstrapped 100 times to provide some idea as to over- or under-representation reliability. Will convert 25k Affy GeneChip IDs into AGI IDs and vice versa. Multiple mappings are highlighted, as shown in blue in the example output. MASTA is a tool for probing differentially expressed genes against a microarray database for in silico suppressor/enhancer and inhibitor/activator screens. The MASTA package allows to easily analyze about 600 contrasts (eg. treatment vs. control or mutant vs. wild type) that were derived from publicly available microarray datasets in Arabidopsis. 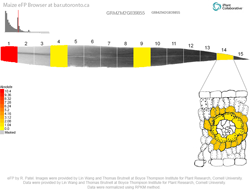 GeneMANIA is an online tool from Quaid Morris' lab at the CCBR in Toronto for fast gene function prediction using large-scale data sets from Arabidopsis, including coexpression, protein-protein interactions, localization, and others. Input a gene or list of genes and GeneMANIA will try to extend that list based on these data sets. Also linked to in the output of our eFP Browser. 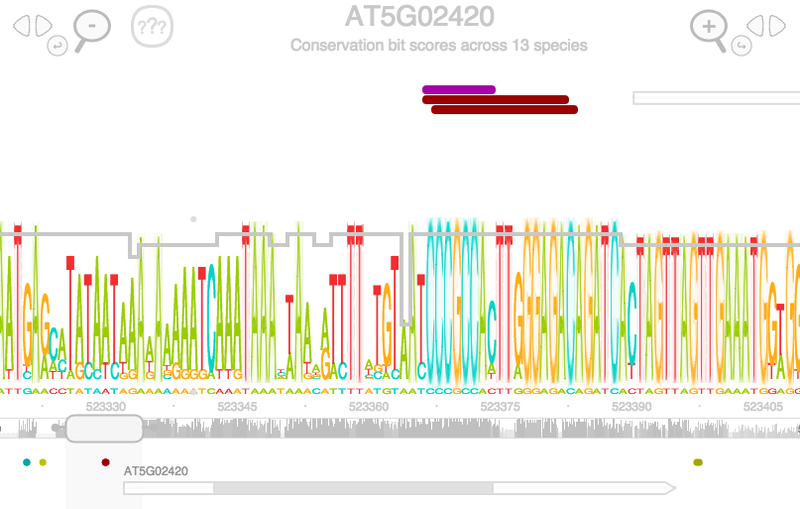 AraNet from Sue Rhee's lab has been loaded into GeneMANIA for easy exploration. Topo-phylogeny is a new approach to displaying phylogenetic relationships. 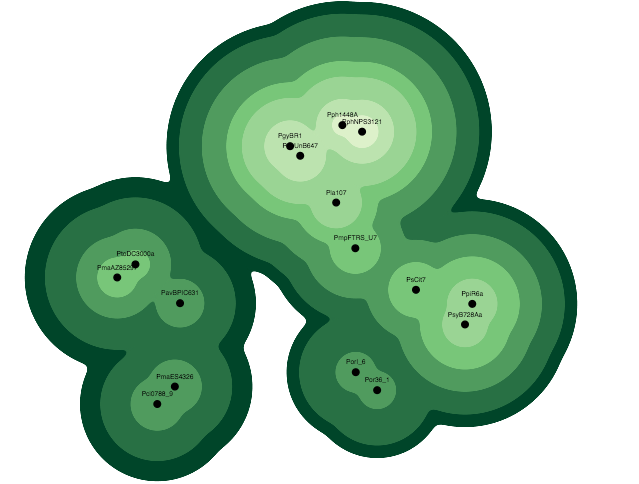 It visualizes each node of a tree on a two-dimensional map, with the placement, color and size of each item determined by its connection to parent and sister nodes, hierarchical level and distance from the root. Topographic contour lines indicate which level groups of related items are connected at, and gaps between clusters indicate clades from a different lineage. 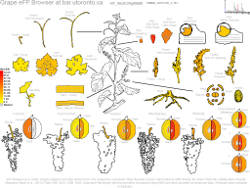 The BAR is funded in part by Centre for the Analysis of Genome Evolution and Function, grants from the Canada Foundation for Innovation to NJP, and from Genome Canada to the Arabidopsis Research Group at the Department of Cell and Systems Biology, University of Toronto. We are available for contract work and collaborations. We also have positions available for outstanding graduate students. 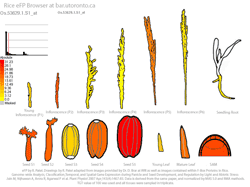 Arabidopsis GO Classifications from TAIR, ATH_GO_GOSLIM.txt. [most recent version as of August 12, 2015]. Arabidopsis Annotations from TAIR, called TAIR10_functional_descriptions_20140630.txt, was merged with Gene Aliases from TAIR, called gene_aliases_20140630.txt. [most recent as of August 12, 2015]. The MapMan data used by Classification SuperViewer is updated to Ath_AGI_LOCUS_TAIR10_Aug2012.txt. [most recent version as of 4 June 2013]. Promomer data sets are updated to TAIR10. [most recent version as of 4 June 2013]. Arabidopsis GO Classification from TAIR, ATH_GO_GOSLIM.20120925.txt. [most recent version as of September 25, 2012]. 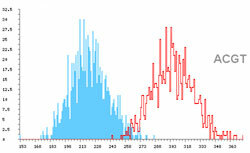 Literature-documented PPIs from TairProteinInteraction.20090527, and IntAct Arabidopsis Interactions as of 5 May 2010. 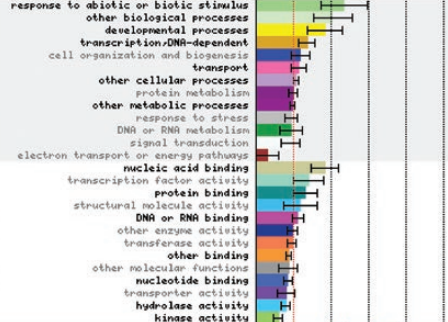 Another source is associomics.org AMPv3 membrane protein interactome data from the Frommer lab, and Pascal Braun et al. 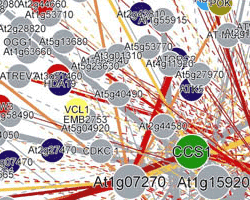 's Arabidopsis Interactome.